April 21, 2010 --3:30 p.m.
April 22, 2010 --3:30 p.m.
April 23, 2010 --11:00 a.m. I will explain how the opaqueness of some financial markets, particularly over-the-counter markets, affects the valuation of assets and investment behavior. Investors in some markets are often unaware of the "going price," and must search for suitable trading counterparties. The degree of market opaqueness is indicated by variation in execution prices across different trades at a given time, and the impact of supply shocks and information releases on price behavior over time. I will review some modeling approaches and some of the empirical evidence. Darrell Duffie has been on the finance faculty at Stanford since receiving his Ph.D. from Stanford in 1984. He has authored books and research articles on topics in finance and related fields. 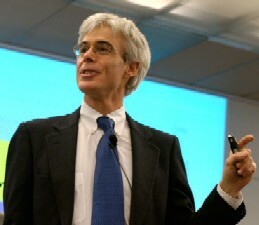 His research interests include incomplete security markets; derivatives markets; financial risk management; capital asset pricing theory; preference theory under uncertainty; security design; term structures of interest rates; credit risk, systemic risk in capital markets, valuation of corporate and sovereign debt, swaps, and credit derivatives.